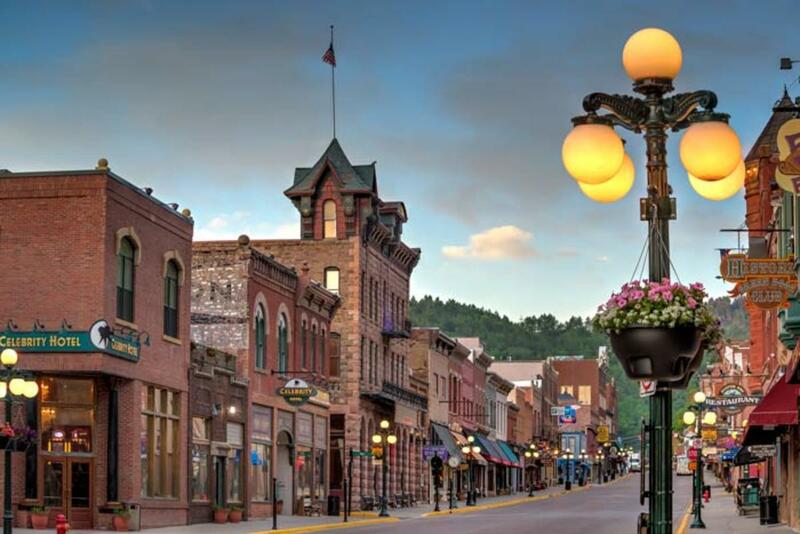 Anyone who has spent much time in the Black Hills has most likely seen Deadwood, and knows it to be a historic gambling town where many famous Wild West characters hung out and died. Legends like Wild Bill Hickok and Calamity Jane each left their mark. Hickok, a legendary man even in his own lifetime, was shot in the back of the head by Jack McCall, while playing poker at the No. 10 Saloon on August 2, 1876. Calamity Jane was renowned for her excellent marksmanship, as well as her preference for men’s clothing, and brash behavior. Deadwood also had, in addition to its tough individuals, others such as Reverend Henry W. Smith. Preacher Smith was the first Methodist minister to come to the Black Hills. Smith was mysteriously murdered on Sunday, August 20, 1876, while walking to Crook City to deliver a sermon. These individuals are just a few of the many notables buried in Mount Moriah Cemetary, which was established in 1877 or 1878. 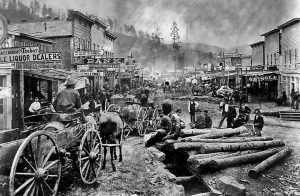 That’s all well known to many people, but some may not know that the settlement of Deadwood began illegally in the 1870s on land which had been granted to the Native Americans. In 1874, Colonel George Armstrong Custer led an expedition into the Black Hills and announced the discovery of gold on French Creek near what is now Custer, South Dakota. 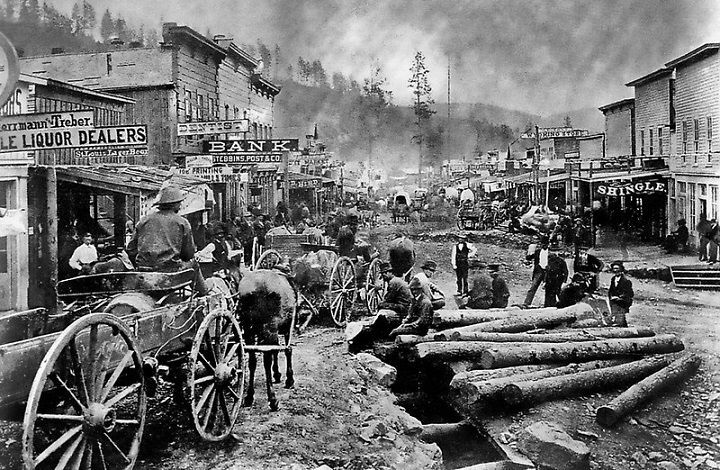 That announcement ushered in the Black Hills Gold Rush and gave rise to the new and lawless town of Deadwood. In 1875, a miner named John Pearson found gold in a narrow canyon in the Northern Black Hills. This canyon became known as “Deadwood Gulch,” because of the many dead trees that lined the canyon walls at that time. The name stuck. Try as they might, the government couldn’t keep the situation under wraps, in order to honor the 1868 Treaty of Fort Laramie, which forever ceded the Black Hills to the Lakota-Sioux. The government dispatched several military units to forts in the surrounding area to keep people from entering the Hills. However, people illegally entered the area anyway, searching for gold or adventure. Despite the efforts of the military and federal government. They were driven by dreams and greed. Once Deadwood was established, the mining camp was quickly swarming with thousands of prospectors searching for an easy way to get rich. Fred and Moses Manuel, claimed the Homestake Mine, which proved to be the most profitable in the area. Although the Manuels had been lucky, others were not so fortunate. 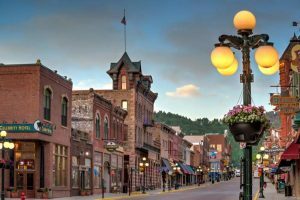 Most of the early population was in Deadwood to mine for gold, but the lawless town naturally attracted a crowd of rough and shady characters too. These particular individuals made the early days of Deadwood rough and wild. A mostly male population eagerly patronized the many saloons, gambling establishments, dance halls, and brothels. These establishments were considered legitimate businesses and were well known throughout the area. In 1890, the railroad connected the town to the outside world. Illegal beginnings aside, Deadwood was a town that was now here to stay. The treaty with the Lakota-Sioux was broken and the Black Hills would never again belong to them. As unfair as it was to break the treaty, I don’t think that it could have lasted forever anyway, because the United Stated was going to be populated from coast to coast one way or the other.